When asked to develop an app, customers usually ask for the app to support multiple platforms. Small companies cannot afford to develop each version of the application using their proprietary development tools. That would be very costly and it would take many more hours to get the final product. For instance, to develop the iOS version, developers would need to use Apple’s Development Tools. To develop the Android version, use Google’s Development Tools and when developing the Windows Phone version, use the Microsoft Development tools. You see where this is going? A bigger development team will be needed where each team specializes in a platform. Then we’ll need testers for each of the platforms as well. I still didn’t mention the maintenance, which may become harder and harder as the app becomes more complex. That’s where cross platform development tools come into the game. Most big companies are already implementing them as they save a lot of time and produce a lot less bugs. Not to mention that the maintenance becomes much easier to manage. Today’s cross platform development tools can share 90% or more of the code between all 3 platforms. This saves a lot of time and hassles for the development team. The application will perform as fast as if it was written in its proprietary language and all the same features will be available in a shared code architecture. Another factor the development company needs to take into consideration, is the size of the screen. 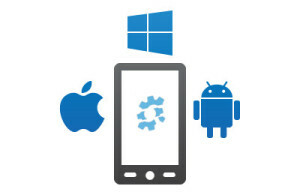 If an app needs to be ran in iPhones, iPad, iPods, Android phones, tablet and Windows Phone devices, the testing of the app also increases tremendously as not only the UI needs to be tested, but also making sure that all functionality will be 100% compatible with all those devices. If building native apps, it is possible to also share a big part of the UI code in a cross-platform architecture. When building apps using a grid layout style, apps can adjust itself to the different size of screens. Just like an html5 responsive website would adjust itself. Talk to one of our specialist about building your next app that supports all major platforms and saves you a lot of the costs by sharing most of the code. Contact GoDevTeam to get started! GoDevTeam.com - Copyright • 2015 • inPulse Inc.